One difference I have noticed on being married again after many years of being single is that keeping road kill in the deep freeze is not so acceptable. I now bait for buzzards using supermarket chickens at just under £3 a go, which is fine on days I am not photographing and acceptable in the freezer. On photography days I need to find something more natural. Partridge has been a good compromise as they are bought from the butcher and use up little space in the freezer. The estate I work on has no livestock and therefore the grass is not short enough to bait up on the ground so I put posts up in the fields and nail the partridge to the top. 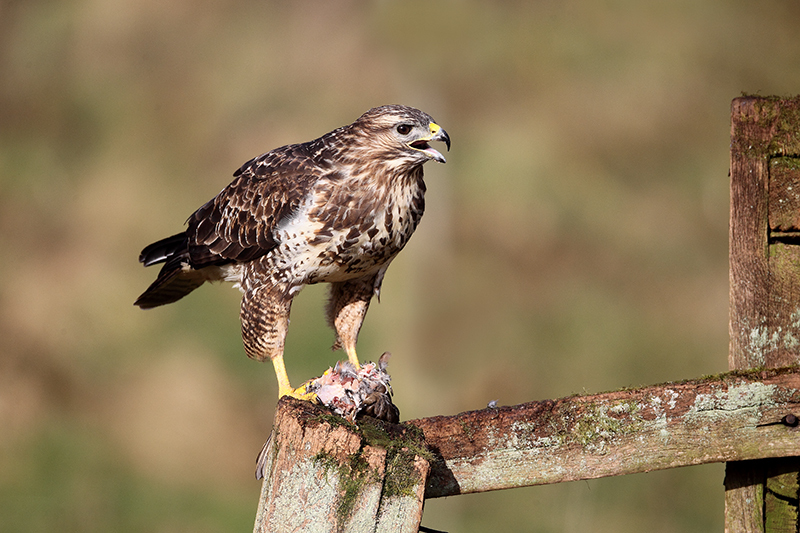 After this session in the hide I have now moved the post so that the background is darker, as in this shot the buzzard and backdrop are too similar in tone. Canon Eos 1d Mk1v. 800mm lens. 1/600th at f5,6. 400 iso. Posted on January 30, 2013, in Uncategorized. Bookmark the permalink. 1 Comment. Love it Mike – I know what you mean! My partner for some reason doesn’t like me putting dead rabbits in the freezer (although I can usually get away with a bag of chicks!) I can see me buying a separate freezer in the future – particularly as I’ve just spent two weeks baiting red kites with rabbit. It worked a treat though. Lovely natural shots Mike – as always.